The 7700K isn’t the best processor around – check out our pick of the best CPUs for gaming right now. The top-end Kaby Lake chip is a depressing slice of silicon because, despite how resolutely unimpressive an upgrade it is, the Core i7 7700K is still the most advanced desktop CPU you can buy right now. It’s as good as the 7th Gen Core architecture gets until we see Kaby Lake-X towards the end of this year, but compared with the 6th Gen Skylake chips there’s little new here to get excited about. Sigh. Click on the quick links below to jump to your favourite category. I likes benchmarks, me… ooh, look at the graphs on that. 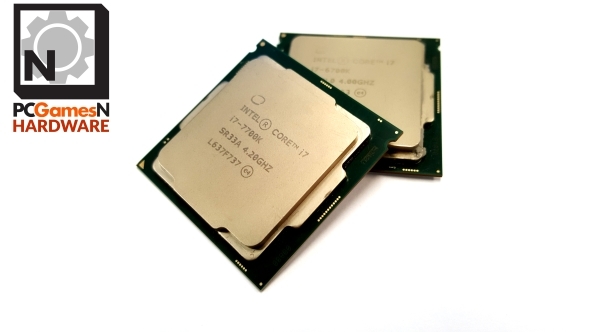 The Core i7 7700K is the direct replacement for the Core i7 6700K and is almost identical to the previous chip in a number of ways. For a start we’re still looking at more or less the same 14nm production process at play with the Kaby Lake i7, it’s still essentially using the same Skylake architecture as well as the same four cores / eight threads HyperThreaded configuration. It also slips into the same LGA 1151 slot as Skylake, has the same TDP and the same cache. That means you can either drop a Kaby Lake CPU into an existing Z170 board or choose one of the Z270 motherboards as the home for your new CPU. You can also do the same with last-gen Skylake chips; so if you fancy some of the goods on offer with a 200-series board but don’t feel the need to upgrade your 6th Gen Core CPU you don’t have to. And this is mostly because they’re basically the same damned chips with just the very slightest of tweaks. Sadly this looks like what we’re going to have to live with for the tertiary phase of Intel’s new Process>Architecture>Optimisation cadence. Previously Intel’s CPUs were either built on a new transistor node or featured an entirely new microarchitecture. This was the basis for the ol’ tick-tock release schedule where the tick was a die-shrink on an existing architectural design and the tock was a whole new CPU layout. This changed to a three step, Process>Architecture>Optimisation, approach thanks to the increased difficulty in effectively shrinking the size of functional transistors. That’s been abandoned before we’ve even had one release cycle, so it’s now tick, tock, stutter, flail, flog an old production process. 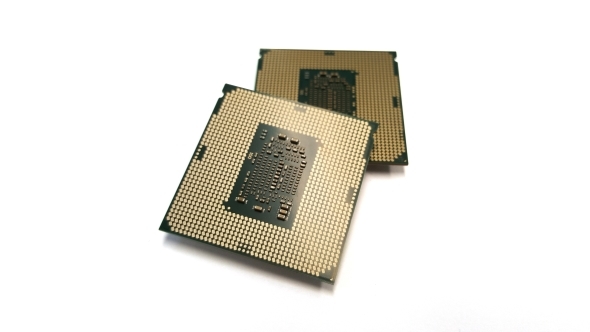 We have a couple of optimised chip generations coming out to extend the life of a CPU architecture featuring both the current design and the existing production process. 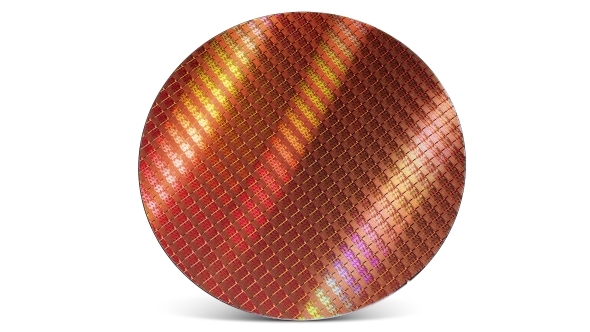 At least Intel are giving us another couple of cores to play around with in exchange for almost zero architectural changes with the upcoming 14nm Coffee Lake designs. 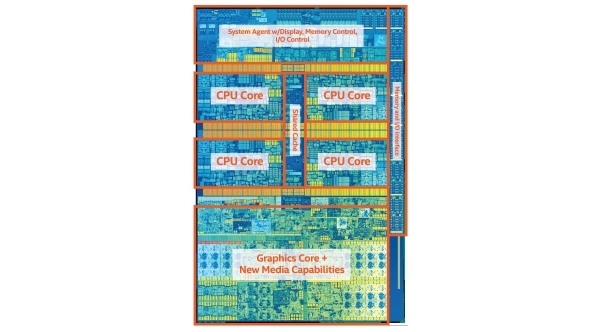 I guess the thinking is that with both a mature processor design and a mature lithography Intel will be able to squeeze out every last drop of potential performance from their chips. 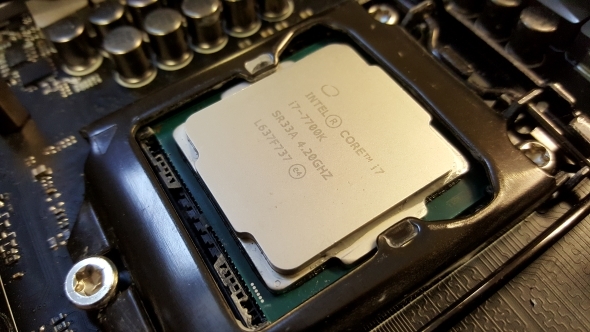 As the name suggests, the 7700K is another K-series variant, which means it has an unlocked multiplier and, given the optimised process, we ought to hope the overclocking performance of the Kaby Lake generation has been boosted. In reality though we’re just getting a processor which maintains the previous generation’s dominance but is incapable of really pushing things any further. As I said though, there are some slight tweaks. The main one being the change in base and Turbo clockspeeds. 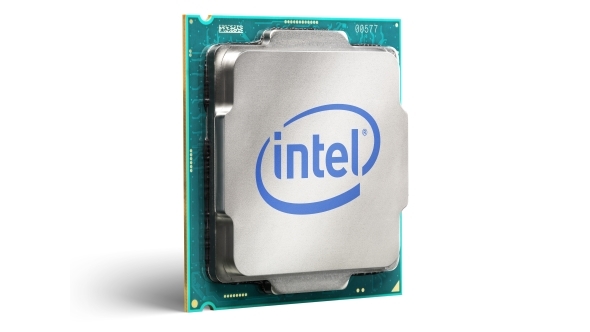 Out of the box the Core i7 7700K comes with a 4.2GHz base and 4.5GHz Turbo frequency. This is a function of Kaby Lake being an optimised version of the Skylake architecture’s 14nm design. Twelve months after then inaugural Skylake release Intel have been able to wring a little more performance out of the silicon with only a little extra energy required using small changes in the production process, now called 14nm+. The other big change is the new Kaby Lake media engine. This means that as of now 4K media streaming is available on the PC because Intel have enabled hardware-level acceleration for the encoding and decoding of 10-bit HEVC content. Despite having the power to run 4K media the Skylake and Broadwell generations haven’t had the native hardware acceleration necessary for streaming the 4K out of Netflix. Though you are still going to have to use the Edge browser if you want it running on your PC. When it comes to the CPU-based graphics inside the i7 7700K they’re exactly what you might expect, entirely irrelevant to us. We’re dedicated to PC gaming here at PCGamesN, and Intel’s HD graphics are not. End of. We posted an early preview of the Core i7 7700K’s performance in the Skylake generation’s Z170 motherboards and were largely unimpressed. Things haven’t really changed since we’ve been able to test the capabilities of the Kaby Lake i7 in its own Z270 platform. Put up against AMD’s octa-core Ryzen chips, like the R7 1800X, the Intel chip is still able to deliver superior gaming performance even if it can’t match the full multi-threaded chops of the Zen architecture. That’s going to be a little frustrating if you were hoping the $500 Ryzen flagship would be able to replace the Core i7 as the peak mainstream CPU, but considering the 7700K is cheaper and can still overclock like a hero it is a better chip for gamers. Compared with the Skylake i7 it’s replacing though it’s not as clear cut. As expected, the clockspeed bump from a Turbo of 4.2GHz with the Core i7 6700K to 4.5GHz with the i7 7700K means the Kaby Lake chip is able to produce higher benchmark performance across the board compared with the Skylake CPU. Realistically though the performance uplift is observable but not tangible. The 7700K is some 6-7% quicker in our straight CPU benchmarks, but less than 2% quicker when we use Futuremark’s system-wide tests. The PCMark and 3DMark scores are indicative of what little difference the optimisation of the Kaby Lake CPUs has made upon gaming performance. I’ve chosen the Hitman and Doom benchmarks, using the DirectX 12 and Vulkan APIs respectively, as they’re the ones with the greatest difference in benchmark scores. The DX11 Total War: Attila and DX12 Deus Ex: Mankind Divided tests showed absolutely no variance between the Skylake and Kaby Lake chips. Where things do make a little more sense is on the power side of the equation. Kaby Lake uses both an optimised CPU architecture and production process and that should equate to greater efficiency. While things don’t look that impressive when you’re comparing the two stock-clocked Core i7 processors the optimisation of the Kaby Lake chip becomes evident when you start to push them further. It’s easy to get the 6700K to run at the same level as the 7700K. Our Skylake chip is a standard retail sample and can happily hit 4.8GHz overclocked, so clocking in at the Kaby Lake chip’s 4.5GHz is no problem. With clock-for-clock parity though the 7700K runs 10°C cooler than the 6700K and uses 5% less energy to do so. But if you were hoping, like me, the performance optimisations would lead to a CPU generation more than happy to boost over the 5GHz mark for larks then you’ll be disappointed. I’ve only been able to complete a full benchmark run at 4.9GHz, just 100MHz higher than the Skylake i7. Inevitably that’s not going to translate to any meaningful performance lead. I did manage to get the 7700K booting at over 5GHz, but it was by no means stable. I could run relatively CPU-light workloads at that speed, such as games, and even managed a few runs of Cinebench, but the aggressive X264 v5 benchmark kept making the system fall over. It didn’t seem to matter how much extra voltage I gave the system, it couldn’t get through a full run. The other issue is that with the extra voltage temperatures go through the roof, even with a closed-loop water cooler whirring away atop it. I had to shut down the X264 v5 test when I started upping the CPU voltage because my 7700K was running up to 100°C. Even in the stable 4.9GHz configuration it was peaking at 92°C which just feels too high to be run like that as normal. Frustratingly this seems to be down to the thermal interface material (TIM) Intel are using on both the Skylake and Kaby Lake CPU generations. The heatspreader sits between the processor itself and the cooling block of your chip chiller, inside that heatspreader is a thermally conductive compound designed to allow as efficient a transfer of heat from CPU to cooler as possible. Unfortunately if you use a poor quality TIM the heat isn’t pulled away from the silicon efficiently enough and the CPU gets super hot. Someone with an early 7700K sample, and potentially a technological death-wish, delidded his processor (removed the heatspreader) and changed out the default TIM inside. That netted him a thermal difference of around 26°C. That’s a big difference in temperature and would make a 4.9-5GHz overclock actually useable day-to-day. As one of the premium K-series chips, designed for overclocking, you might expect Intel to put better TIM in these processors. As all i7s are created equally in the factory however that’s not practicable. Here it comes, the $350 question: should you buy the Core i7 7700K? The answer is not an easy one because while the top-end Kaby Lake processor is the most advanced CPU silicon around it’s by no means a must-have component. Realistically I can’t recommend you buy a 7700K unless you’re upgrading from a four or five year-old i7 and absolutely need that combination of cores and threads. But even then, it’s not cut and dried – the Core i7 6700K is practically as good and may even turn up a good deal cheaper than the 7700K. The good news there is that if you’ve got a 6700K in your system and were starting to feel a little jealous of the new CPU generation then you’ve got no reason for concern. No-one with a Skylake CPU should consider a Kaby Lake chip unless they’re switching from i3 to i5 or i5 to i7. And if you’re a gamer first then the frame rate performance difference between an i5 and an i7 CPU is minimal, so I’d recommend you make a beeline for the more interesting i5 7600K rather than the top-spec Kaby Lake. Though, that said, if you’re looking to put together a new rig from scratch then AMD’s fantastic Ryzen 5 1600X is the CPU I’d recommend building your new rig around. It’s got three times the thread-count of the K-series i5 and can pretty much match if for gaming performance for the same price. And that also makes it significantly cheaper than the i7 7700Kandstill has a higher core and thread-count for any games or apps that do benefit from multi-threaded CPU performance. 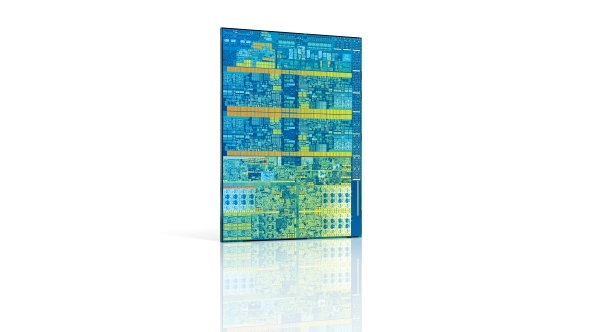 Kaby Lake’s top chip then is entirely uninspiring. The Core i7 7700K isn’t a worthy CPU upgrade, only really of any interest if you’re dead set on buying a brand new, pre-built i7 rig. So, bring on Zen. Don’t let us down.